For reasons I cannot quite put my finger on, I ordered Chasing the Perfect: Thoughts on Modernist Design in Our Time by Natalia Ilyin via interlibrary loan. And, improbably, I got it. Given that Heller has dominated the design literature for decades, and doesn’t understand or even like blogs (other mention), such dismissal seems like a way of putting down a competing writer who came up with a form Heller never thought of. Like conglomerates manufacturing multiple laundry detergents that “compete” with each other to achieve a higher aggregate market share, Heller seeks to own every segment of design writing. Except that bloggers, and Ilyin, came up with a couple he never did. I devoured this book in one sitting (easy enough, as it is essentially double-spaced in Scala), and much of it rang true, although I don’t think Ilyin’s lessons can be applied across the board. Then again, that’s something only Heller would expect. Graphic designers don’t draw well. That generality is a modernist convention, a modernist rule…. [W]e don’t shade, we don’t go in for realism, for perspective…. We never really render, as it were. […] [Most professors] look down on realistic drawing…. Because they themselves were silently discouraged from drawing well… by their professors, many of whom were refugees when the Nazis closed down the Bauhaus…. To a modernist designer, illustrators are people who just make things pretty on the outside. I can barely sign my name. I cannot produce an isometric drawing of a shoebox even if it’s sitting in front of me. (But I’m not a designer.) Still, I’ve been in countless meetings where somebody clumsily and hastily scribbles a “drawing” on a whiteboard, with no effort at realism, scale, or accuracy. It’s supposed to be “just a quick drawing,” and the “quick” part is always supposed to supersede everything else. But the drawings are always so poorly executed that I, a reasonably visual person, have to sit there and struggle to figure out what they are drawings of. I have to infer the ostensible subject of the drawing. We know that the computer causes the opposite problem (overspecific drawing, where you can’t even doodle), but it’s true: People don’t try hard enough. I unwittingly followed the No-Draw Rule for years…. I spent my time reducing everything to Frutiger and to line and vector and plane. ¶ But you know what? After a couple of biopsies and a significant root canal, the realization that I will not live forever hit me at 40 and with it the sudden knowledge that, by God, I like drawing little curlicuey things. I like soft colours and comfortable chairs…. I am just not interested in spending the rest of my life in the dogged pursuit of someone else’s definition of perfection anymore. 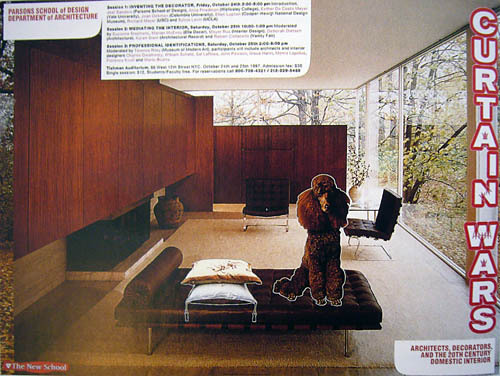 This poster, featuring a manicured poodle cleverly inserted into an archival photograph of Mies van der Rohe’s iconic Farnsworth House, was designed by prominent New York design studio Bureau to announce a… symposium on the professional enmity between architects and interior designers. Members of Parsons’ interior-design department objected furiously… claiming that using a poodle to represent interior design once again reinforced an antiquated stereotype – that designing interiors is the joy of the frou-frou poofter, whereas designing architecture is the sacred duty of godly men in ties. Yeah, but designing signage and caption fonts so they produce measurably easier and more accurate reading is considered just as girly as designing a wedding invitation – or the bridal gown. She wanted me to die in a dust-free environment with a security system and a charming host, far away from anything that smacked of reality, far from anything that could give me a sense of my own identity, of the worth of that identity…. I didn’t like a little imperfection, a little edge, nervous-making real life? Well, then. How about staying in a germ-proof lantern with no fresh air for a few days? Huh? How about camping out in a place that is so clean, so beautiful, so thought out, so complete, so filled with impossibly valuable simple objects that you will lie in the guest bed and feel the weight of all that design pulling you down like the stones Virginia Woolf put in her pockets as she waded into the river? Everyone whose eyes bugged out at digital type on the Macintosh but hated the missing ligatures and the spindly photo versions of metal typefaces, the faked-out Optima and Eras, which now only the old guard remember, who wanted Multiple Masters to work, who hacked WordPerfect for DOS to produce better type than a Mac could, who design a hundred swash characters into a sansserif typeface for subway signage, who know what an l -caron looks like compared to a c -caron, who designs three versions for footnotes, body copy, and headlines, who makes fonts out of shopping carts or bricks, who sits down with somebody whose glasses could fry an anteater and asks if they can really read this, who turns on ClearType on the Wintel boxes behind the backs of the poor sods who are stuck with them, who loved House Industries before they went commercial with Neutra – well, you are at least trying to live a proper and full and unified vie typographique . Not every single thing must be cold and hard and perfect. This realization, articulated for me by Natalia Ilyin, puts my cold, hard, perfect home rather at odds with other needs.